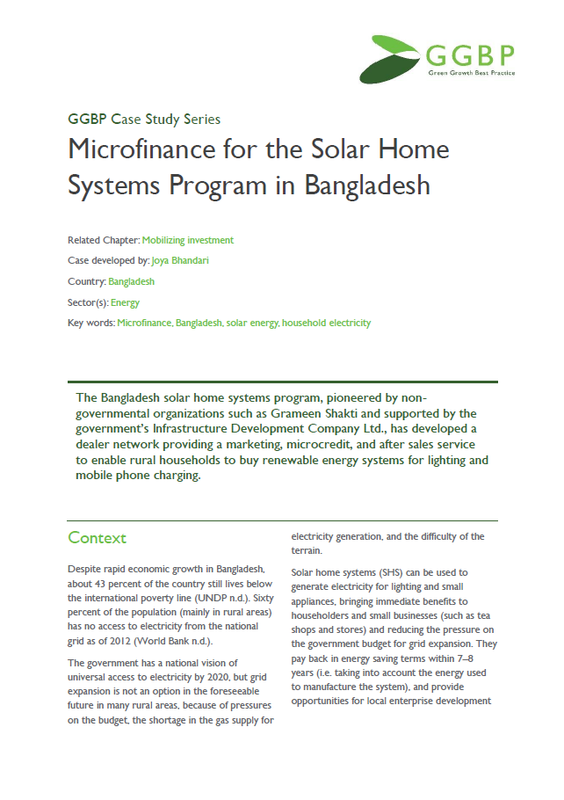 The Bangladesh solar home systems program, pioneered by non-governmental organisations such as Grameen Shakti and supported by the government’s Infrastructure Development Company Ltd., has developed a dealer network providing a marketing, microcredit, and after sales service to enable rural households to buy renewable energy systems for lighting and mobile phone charging. India launched the Jawaharlal Nehru National Solar Mission in 2009 to create policy conditions to make solar power as affordable as conventional power by 2022 and establish the country as global leader in solar energy. The case study Benefits of Low Emission Development Strategies: The Case of Clean Energy Policies in Bangladesh summarises the Resources to Advance LEDS Implementation (RALI) project’s modelling efforts and quantifies the potential job impacts associated with two different clean energy scenarios.